It’s been cold, then hot, then cool, then hot, then cold here in Austin. I’ve decided to call it winter and leave it at that. So whether it’s 70 degrees or 30 degrees outside, it’s winter, darnit, and winter means soup. This one’s so simple…nourishing and comforting and delicious. It was also really easy to throw together. 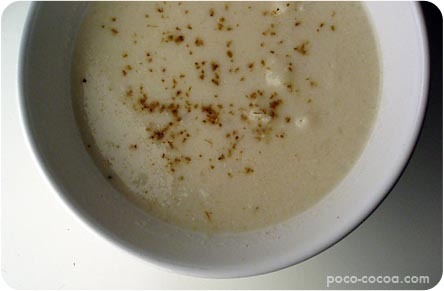 I often make this cauliflower soup, but it takes a bit longer with the roasting and the sauteing and all. The toasted cumin and squeeze of lime adds a little something special to what might be an otherwise humdrum soup. I’ll definitely be making this one again, especially now that the farmer’s market is full of huge, lovely heads of cauliflower. In a dry small skillet toast the cumin seed over moderate heat, stirring, for 3 to 4 minutes, or until it is fragrant and several shades darker, being careful not to let it burn; set aside to let the cumin seed cool. Once cool, grind the cumin seed into a powder with a mortar and pestle. In a heavy saucepan cook the onion in the butter over moderately low heat, stirring, until it is softened. Add the cauliflower, the broth, and the water and simmer the mixture, covered, for 20 minutes, or until the cauliflower is tender. Using an immersion blender, purée the mixture to your desired consistency and stir in the cream, the lime juice, and salt and pepper to taste. Heat the soup over low heat, stirring, until it is hot, but do not let it boil. Ladle it into bowls, and sprinkle it with the cuminseed powder to taste. happy new year crystal! that soup looks delicious and i’d love a bowl of it right this moment.